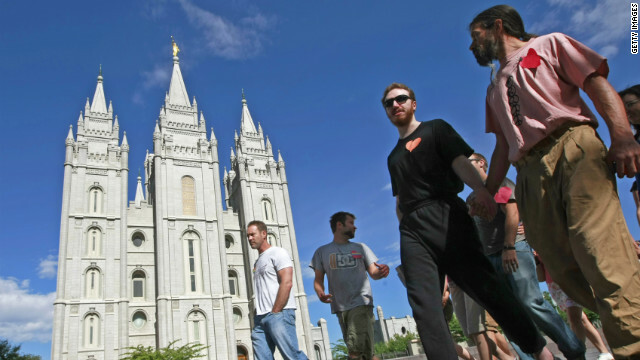 Gay rights activists hold hands in protest in front of the Mormon Temple in Salt Lake City, Utah, in July 2009. Washington (CNN) - Kevin Kloosterman, a former Mormon bishop, said he “came out” last year – just not in the way that many people associate with coming out. “I came out and basically made a personal apology to (lesbian, gay, bisexual and transgender) folks for really not understanding their issues, not really taking the time to understand their lives and really not doing my homework,” Kloosterman said in an interview with CNN. Though not speaking on behalf of the church, the then-bishop stood in front of a crowd of gay and straight Mormons at a November conference on gay and lesbian issues in Salt Lake City, Utah, where the Church of Jesus Christ of Latter-day Saints is headquartered. Donning a suit and tie, Kloosterman was visibly shaken, struggling to find the right words as tears welled up in his eyes. God did not destroy sodom because people are gay. God did it because no one was seeking God. Stop generalizing christians. Excellent! More and more people are recognizing how their intolerance and misunderstanding of gays and lesbians hurt everyone, not just those they attack. Wow who are you to say that Bob. Are you God? There is no place on this planets for evil haters like yourself.